The Square Jellyfish Jelly-Grip Car Air Vent Mount has a strange name to be sure but don’t let the name fool you into avoiding this well made mount. We took some time this weekend to evaluate this mount and were happy with the outcome. So while, it’s fresh in my mind, here’s a review. The mount comes professionally packaged in a retail box that reminded me of something purchased at the Apple Store. A thorough instruction pamphlet is included in the box. The pamphlet tells you how to attach the Jelly-Grip mount to the air vent. There are also instructions for using the mount for a smartphone or Garmin GPS. There are details of a one-year warranty included in the pamphlet too. The Square Jellyfish Jelly-Grip mount can be used to hold most smartphones or a Garmin GPS. You see, all Garmin vehicle GPS devices made over the past ten years include a custom cradle that has a 17mm socket on the back. Remove the cradle from the Jelly-Grip mount and you have a 17mm ball. Just snap the Garmin cradle onto the Jelly-Grip mount sans cradle and your GPS can be mounted to the air vent. The photo that accompanies this article is the Jelly-Grip mount attached to the center air vents on my Nissan Murano. It’s one of the few air vent mounts that can function in the Murano. People familiar with a Nissan Murano, know that starting in 2015, they made the interior really curvy. There is a lip just beneath the middle air vents that prevent most mounts from working properly. The lip gets in the way of anything that’s mounted. The Jelly-Grip however extends the cradle beyond the lip. I can mount my big huge Apple iPhone 6s Plus with giant Otterbox Defender Case without a problem. A unique part of this mount is the way it attaches to a car air vent. There is a single metal hook that’s at the top of the mount. That hook can be extended or retracted by turning a knob that’s behind it. You need two hands to do this. Maybe three. Extend the hook as far out as possible by turning the extension knob counter-clockwise. Then insert the hook over the vent slat and turn the extension knob clockwise until the hook is holding the back of the vent slat tightly. According to the manufacturer, this mount will work on air vents with flat louvers 3/8 to 1 inch in depth. They claim it will work on horizontal or vertical vent louvers. My vent louvers are all horizontal and it fit well. I don’t know how well it will work on a vertical louver once there is weight on the mount but it says on the box it will work. The included holder part is well made. A typical cradle that expands from the left and right simultaneously. The holder expands up to 3 5/8 inches. That’s wide enough to hold most large smartphones even with a thick case or skin. I mentioned my Apple iPhone 6s Plus with giant Otterbox Defender case. It fit albeit with little room to spare. The cradle has a socket on the back and the mount has a ball. This enables the cradle to tilt and swivel 360 degrees. The mount held my phone securely in landscape position which is what I like when using it with Waze which is my favorite GPS application. 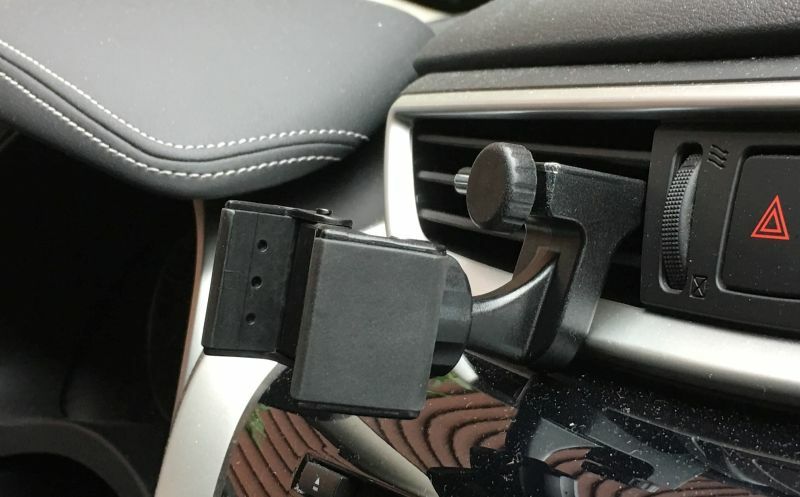 The Square Jellyfish Jelly-Grip Car Air Vent Mount is a good mount for a large smartphone or Garmin GPS. While not the easiest in the world of mounts to attach, once it’s on, I experienced a secure fit and it’s one of the few that works on my Nissan Murano’s center vents.